Have you ever heard the story of The Patient Bullet? In 1883 in the town of Honey Grove, Texas, Henry Ziegland dumped his fiancé, Maysie Tichnor. She was despondent and committed suicide. Her enraged brother decided Ziegland had to die. He went to Ziegland’s farm and shot the young man who had hurt his sister, then he turned the gun on himself. Unbeknownst to the brother, Ziegland did not die. He wasn’t even seriously hurt. The bullet had only grazed him before hitting a tree. Ziegland prospered in life. Twenty years after he dodged a literal bullet, he and his son were cutting firewood. They cut down the tree with the bullet in it but the wood was so tough, it was almost impossible to split it with an axe. So, they bored some holes in the fallen tree and put small amounts of dynamite in the holes. Ziegland and his son moved about 50 feet away and set the explosions off. 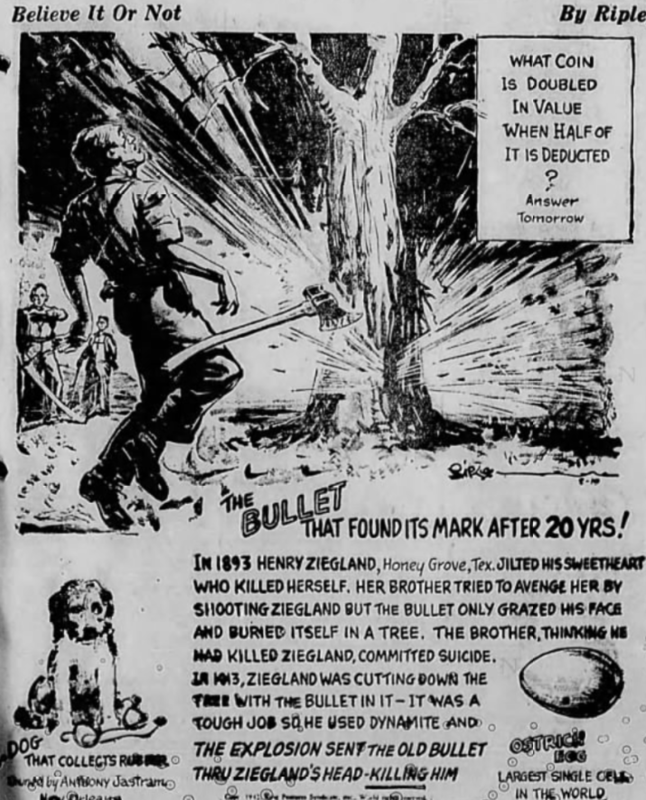 The bullet, which had waited twenty years for Henry Ziegland, was blown out of the tree with great force and the farmer was hit in the left temple, and killed instantly. I love weird historical stories and coincidences. There are a surprising number of them that check out. This story is fairly popular – there are lots of posts about it on the Internet and you can even see pictures of the tree and the bullet. Honey Grove, Texas still exists today. The story appeared over 100 times in the newspapers, where it was presented as legitimate news, but there is quite a bit of evidence to suggest the story of Henry Ziegland was a hoax. There is no record of anyone with the names Ziegland or Tichnor or anything similar that ever lived in Honey Grove. No vital records could be found for people who match these dates and descriptions in Texas or any other state. The story disappeared for the better part of the decade, and inexplicably reappeared in 1913. The names were unchanged but the newspapers still ran the story as current news. This time around, the story got a lot more traction. It ran in newspapers from Edmonton (Canada) to New Orleans to Buffalo. The success of this hoax is far more impressive than the fabricated story of Henry Ziegland. It was probably started by a couple of teenagers sitting around in 1905 who came up with this funny little story and decided to see if they could dupe a newspaper into publishing it. Not only were they able to get it published but by 1913, the story was appearing in international newspapers. And over a century later, a lot of people still believe this story is true and continue to spread it. A Google search for “Henry Ziegland bullet” produces over 5,400 results in 0.35 seconds! Well that was a pretty elaborate hoax..cudos to the first writers to make it up. If only they knew… they would be overwhelmed with the success of their prank!